When do you stop believing in fairy tales? I don’t suppose that many of us actually do. We all dream at times of winning the lottery, a mystery lover or becoming a secret agent. Isn’t that why fiction is so popular? In it we find our escapism, our freedom to be whoever we choose. I’m sure I can’t be the only one who metamorphoses in to one or more of the protagonists as I read. In fact, I regularly imagine myself as James Bond which maybe why my car spends a lot time with the mechanic. It also may explain why my kids eat their vegs; when you’re looking down the barrel of a Walther PPK you don’t actually have a lot of choice in the matter. But my point is; if a book fails to entice me into its world then I know for sure that it hasn’t really succeeded. Love Letters is a tale that has been repeated many times. Laura Horsley, the heroine, is a university educated, naive 26 year old virgin who works in a book store. Her wardrobe consists of black skirts and trousers, white blouses and flat shoes. She falls in love with a handsome hero and after a few fashion tips, a new career and some routine misunderstandings she captures his heart and well... you can guess the rest. Now don’t be shocked Readers; I know I’m sweet, demure and a typical English Rose but even I couldn’t imagine myself as Laura. This is because not even in my wildest, most outrageous and yes even in my most boring fantasies would I want to be a 26 year old virgin with a life as dull as dishwater where the only fun is reading books. It’s not that I don’t like romances but I just have a fundamental problem with why so many of these romantic heroines are as about feisty as a wet dishcloth. And will someone please explain why these women never, ever have a decent wardrobe? I don’t want to be a bore but when a woman fancies the pants of a guy she usually makes a little bit more effort on the appearance front. Yep, when I had the hots for my hubby I remember making a huge effort (and that didn’t even include the “special” underwear.) Now Ms Fforde doesn’t describe Laura’s underwear but I guarantee, upon pain of losing my chocolate rations, Laura’s the sort of girl who wears Marks and Spencer’s wholesome white knickers with a cotton gusset. I also imagine that after they’ve worn out she uses them for dusting her books. So Laura is definitely no Elizabeth Bennett and, irritatingly, like so many heroines of this genre she only becomes fulfilled as a person as a direct or indirect consequence of meeting Mr Right. Frankly, these insipid women bore me senseless. It’s the 21st century; I want to read about women who have confidence in themselves, who are not afraid to be who they are and who don’t need a man to make them complete. Isn’t the relationship between two fully fledged human beings more interesting? I think so. Love Letters did hold some interest for me though and here’s where it gets intriguing. The plot revolves around our heroine being recruited by a literary agent to organize a literary festival and the hero, Dermot Flynn, is the potential star attraction who she must bring on board to make it a success. It’s fascinating as the novel progresses how Ms Fforde portrays the literary and non literary authors. The successful authors, in fiscal terms, are jolly smiley types writing marketable women’s fiction and the literary types are impoverished slightly sour ones. The only exclusion to this is the hero who is a rare bestselling literary author. However, he has been crippled with writer’s block for 15 years. Yes, 15 years! By God, that’ll teach him to write a literary bestseller! Forced to live with years of mental torture being unable to string two words together whilst simultaneously observing chick lit authors rocket to the top of the bestseller charts! No wonder the poor man took to drink and women. Crikey, even I would take to drink and women in those circumstances - and that’s saying something. Bizarrely, as I was reading Love Letters it crossed my mind that maybe in a subconscious way Ms Fforde was almost justifying to herself writing a book which is basically fluff, albeit marketable fluff. Which leads to the question; how do you measure success? Is it in monetary terms or literary longevity? 200 years on, I wonder what Jane Austen would give as her answer? But the bottom line is Love Letters will sell. 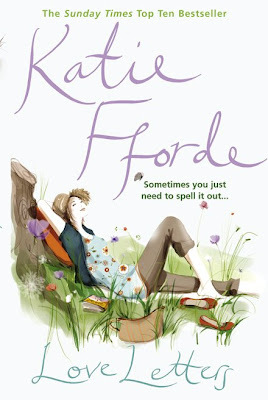 Partially because of Katie Fforde’s track record and partially because this a formula that many women enjoy. It’s not my preferred reading but many women don’t need an intellectual read and there’s nothing wrong with that. The fact that Mills and Boon is so widely read is testimony to the universal popularity of a simple love story and even though I’m a cynic I’m also a great believer that reading anything, so long as it’s useful or enjoyable, is good for the mind and soul. And as far as the author is concerned, I think that whatever you write, literary or non literary, so long as you’re happy with the result that is the true measure of success. The trouble is, I have a sneaking suspicion that Katie knows she hasn’t done herself real justice with Love Letters. Only Katie knows the truth. To read Katie's interview with The View From Here click here. This book certainly wouldn't appeal to me, but I enjoyed the book review, Jane. Mostly because, like your others, they're fun and totally honest. No fluff in your assessment of things! Thanks Gary. Glad you enjoyed the review! You know, I think you're totally right that despite female emanicaption there are many women lacking in self confidence, even in the UK where it is less of an issue. It's a common feature of this genre though that the heroine blossoms during the course of the novel which, obviously, is no bad thing:) However, I would personally like to see more female characters who are strong at the outset. Not only would I find it more interesting but perhaps it would serve the cause of female emancipation greater than perpetuating the image of weak(?) women who are in someway dependant on men. That's my personal preference though and since this genre is so popular I'm sure there are many women who enjoy it just for the pure escapism, irrespective of their situation in life. As for your comment regarding a decent wardrobe - what I really meant (and perhaps I didn't make that clear enough) is a wardrobe that isn't so dull! I'm well aware that many women don't have the funds for designer or big brand names:) But these days in the UK there are plenty of cheap and colourful fashions available for those on a budget. I can't think of many women I've known over the years who haven't tried to make the most of themselves - that said our heroine's preference for practical black and white is entirely suited to her mousey demeanour so I guess Katie got it right! I like strong female charaters in the books I read. Not the wishy washy, pinning females in mills and boon who seem to only blossom when their Heathcliff comes riding in and sweeps her off her feet. Although the romance is enticing, I seriously wonder if thats what we really want. Most women I know what a guy who treats them as an equal, but still opens the door and carries the shopping. A good romance I dont think has to be all fluff and Heathcliffs, but elements of it. I can not understand why the women cant be strong and independant and still lonely,why the man cant be bold and heroic and still caring. Mills and Boon shows a glimpse of what used to be, allows us to view days gone by thats why they are popular. Perhaps inside us is that princess still waiting for her Prince Charing to ride up on his white stallion and carry us off, and while we dream of him we cook dinner for the family. This is just to let you know that I've returned to read your reply. You prefer escapism, I prefer realistic heroines and based on your review plus my previous knowledge of other Fforde characters, I think Laura is a realistic character thus I felt obliged to defend her. Though I'm not a native speaker I know what you mean by a 'decent wardrobe' but believe me it's really difficult to get one. Well, perhaps not in Britain.